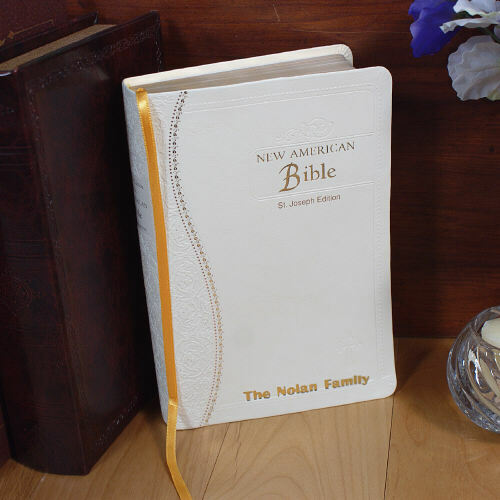 Personalized New American Family Designer Bible. This is the perfect family keepsake bible for years to come. New American Bible is a St. Joseph Edition. Is a beautiful bible filled with gold foil lined pages. The bible has a bible dictionary, 35 self explaining maps showing key events and areas in the bible. It has a family record pages which is located in the middle of the book. Medium sized. Bible is perfect for families, groups and personal study. Measures approx. 6” x 8.5”. Personalization of any name up to 16 letters.